Track your training hours on-the-go with any smartphone or tablet. Track your hours from any device, anywhere. In today’s mobile world, we know it’s important for you to track yours hours on the go. Time2Track Mobile makes it easy to stay up to date with your tracking and enter data right after a session or activity, when the information is fresh. To protect your privacy and the privacy of your clients, we’ve made sure Time2Track Mobile is just as secure as our full version. You won’t have to worry about your data falling into the wrong hands. The mobile feature is super handy and the program is so easy to use. I would highly recommend Time2Track! Time2Track is a lifesaver for busy graduate students! 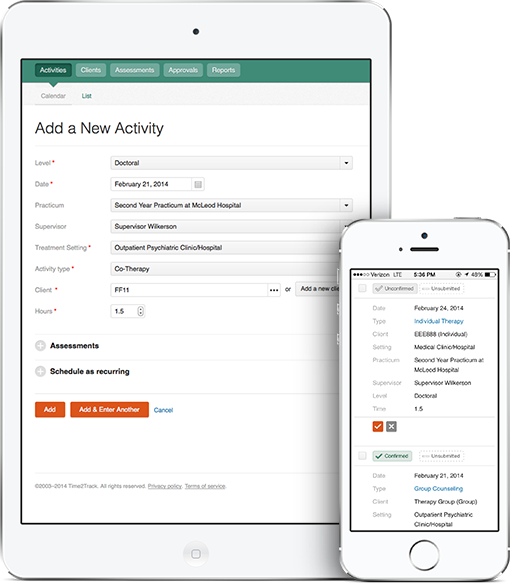 The program makes tracking practicum hours and activities effortless. Plus, I can log in securely – from anywhere – to see my progress. Start Tracking Hours with Time2Track Mobile.